Removals Company Bridport, Woods Removals Ltd.
Moving in Dorset is so easy with Woods Removals. With 140 years of experience under our belt, there’s simply nothing we don’t know about how to get you from A to B with all your possessions, safely, securely and without stress. It’s a task not every removals company in Bridport is competent enough to undertake. But then, not all of them have almost a century-and-a-half’s worth of knowledge and skill. We know the town incredibly well so we won’t waste time dithering on the road. Our BAR-certified movers, drivers and packers are friendly and professional and they always know what they’re doing. And since we’ve encountered every pitfall and problem a move can throw up, we’ve got all the solutions at our command, ready to come into action so that the problem never occurs in the first place. We’ll attend to your move with calm consideration and forethought and we’ll take the time to pin down the unique details of your job. Among our additional services is full packing and unpacking. This stage is entrusted to skilful and diligent people who know what each item requires. They come equipped with all the necessary specialist packaging materials so that valuables and irreplaceables, such as paintings and other objects, are looked after the right way. They know how to prepare and transport grand pianos and other challenging items. They’ll extend the same degree of care to your belongings as they would to their own. If you didn’t already, by know you’ll know that your move is in the careful hands of experts – people who do it right every time because they care. You can’t always be sure of this service when you go to other removal companies in Bridport. We’ll begin the moving process by sending out one of our estimators to pay you a call. Every last detail of your relocation will be noted and given proper thought, so that an accurate and clear quotation can be submitted to you. When you give us the go-ahead, we’ll get straight to action, devising and planning a move without hassle or unnecessary worry landing on your shoulders. Your peace of mind is of the utmost importance to us. And if you need storage in Bridport, we’ve got excellent facilities so your excess possessions can be safely housed while you work out what to do with them. 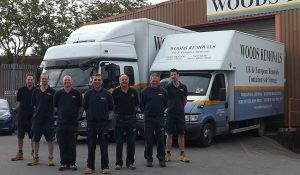 So, from beginning to end, Woods Removals gives you a moving experience that’s worlds apart from the competition.